I swear I can thank spring cleaning for my most recent thrifty finds. First a Drexel dresser for the boys’ room and now two chairs and a foot stool. I found the chairs at Habitat for Humanity ReStore for five bucks each. Sold! They’re solid wood and should be easy to refinish and upholster. Because one has a giant tear in the seat. Oh, and the orange vinyl isn’t my fav. For now, the chairs will live in the family room, replacing the Target slipper chairs, which are in the living room now. I’ve been looking for arm chairs with a smallish frame. Ideally I’d stumble upon something like this for a fraction of the price. But I’m not holding my breath. Until that magical day happens, these are okay. You know, with a little lovin’. Surprisingly comfortable, the small footprint of the chairs fits nicely in the walk path perimeter room. A little more depth would be great to feel more lounge-y. Eventually (when our kids stop wiping grimy hands on everything) we’ll man up and buy adult furniture. How ’bout that footstool/ottoman/side table for $8? After a quick search, I saw many similar stools for sale, some as high as $300. The cane top has damage, but the wood is in good shape. I’m considering cutting a larger piece of plywood to set on top, making this footstool a round coffee table. What would you do to these pieces? Sand and stain? What type and color fabric for the chairs? We’ve got cream leather in the basement that I think could look nice. Thoughts? I wonder if it’s the orange vinyl on the chairs, mixed with the circular footstool that’s screaming ’70’s’ to me. I mean, don’t get me wrong, I like both pieces but maybe not together? I think that circular footstool would be fantastic as a side table. Those chairs are great and I can’t wait to see them reupholstered! When I saw your first pic I thought ‘Wow, that chair color looks really good there!’. Great buy on them, anyway. I think the orange and dark stain looks dated, but I think a camel color leather could look awesome. I’m just not sure what direction I want to go. 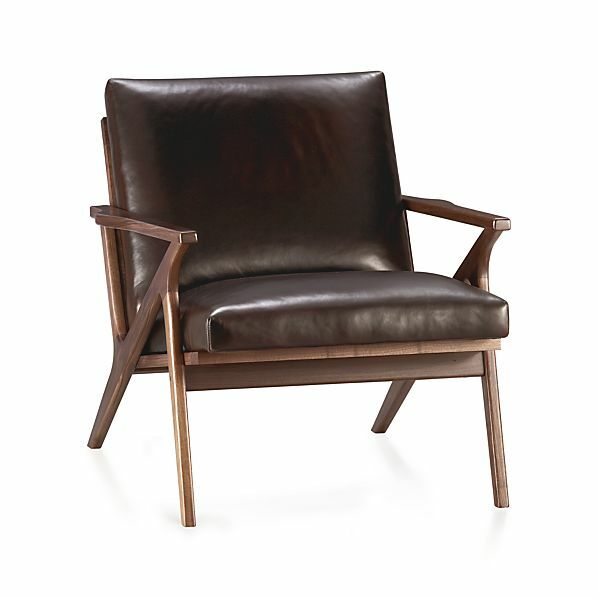 I just picked up a great mid mod chair with leather upholstery similar to the shape of these. The seat also has a tear but it is slightly curved and I’m not exactly sure how to recover them. If you do it, will you do a tutorial? I would love to see the process on a piece so similar to mine. I think all 3 are great finds (especially at those prices!) and look forward to seeing what you do with them! I’m smack in the middle of refinishing a coffee table that is just not going my way…love to see how your chairs turn out! My first thought was that the foot stool is too small for the space but I LOVE your idea of converting it into a coffee table with larger top. Those chairs are also great and I can’t wait to see what you do with them!